CORTE MADERA, Calif.--(BUSINESS WIRE)--May 30, 2017-- RH (NYSE:RH) announced today the release of the 2017 RH Modern Source Book. At 480 pages, this comprehensive design resource presents one of the largest curated and fully integrated assortments of modern furnishings, lighting and décor under one brand in the world. RH has collaborated with some of the most respected designers, artisans, and manufacturers to bring this new collection to life. Gary Friedman, RH Chairman and CEO, commented, “We believe that vision is everything, and this new source book is filled with both vision and visionaries who are redefining the modern market, and inspiring a new and contemporary way to live." Gracing the cover of the new source book is the Channel Dining Table by innovative artisans Thomas Binaand Ed Robinson (Los Angeles), a pure linear form composed of American white oak bisected by a continuous channel, juxtaposed with a monolithic metal base. This season’s many distinctive statement pieces are a reflection of the leading Modern visionaries of our day. Renowned designer and curator John Birch of WYETH (New York) deftly combines clean lines and classic tufting echoing 1950s American minimalism with the Metropolitan Sofa; eminent interior designer Vicente Wolf’s (New York) signature spare and sumptuous style can be seen in the Modern Bali Bed – a reproduction of a Ming Dynasty-inspired piece he created for his own home in the Hamptons; and internationally-acclaimed designer Timothy Oulton’s (London) penchant for relaxed modernism is reflected in the Como Modular Sofa – a customizable sectional offering generous proportions and low-slung comfort. The new collection also brings numerous standout lighting introductions, including distinguished designer Jonathan Browning’s (San Francisco) Vendôme, Arcachon, Montesquieu and Marignan Chandeliers – the latter of which is a stunning interpretation of industrial, machined metal chain crafted of sand-cast brass with more than 1,000 interlocking crystals; as well as Rudi Nijssen & Dominique Sente’s (Belgium) handblown Glass Globe Mobile Collection, where transparent spherical forms appear to float on modern metal architecture. Additional noteworthy introductions include the Sand Walnut and Brass Collection by celebrated designer Barlas Baylar of Hudson Furniture (New York), whose warm, minimalist pieces for living and dining are impeccably crafted of American walnut encased in lustrous brushed brass; and the Cela Shagreen and Solid Brass Collection, a luxe modernist design reflecting a refined 1970s aesthetic by Charlie Zagaroli (High Point). Paying homage to icons of the past, RH Modern also unveils exclusive reissues of some of the most sought-after pieces of the modern era, such as venerated lighting pioneer Robert Sonneman’s (New York) 1967 Orbiter II™ Task Floor and Table Lamps, now rendered in solid brass as well as polished nickel; legendary American architect and furniture designer Adrian Pearsall’s (New York) Curve, Serpentine and Stratus Sofas; midcentury master Milo Baughman’s (New York) Model #1283-113 Swivel Chair, 1965; and in tribute to famed 20th century Italian designer Mariano Fortuny (Venice), the Fortuny® Gold-Leaf Icaro Chandelier. RH’s continued collaboration with renowned rug scion Ben Soleimani (Los Angeles and London) yields 20 exclusive collections. Celebrating his passion for minimalism and abstract tonal designs, Soleimani pairs organic textures with lush, silken yarns and subtle metallic accents that blend tradition and innovation with the perspective of a contemporary artist. 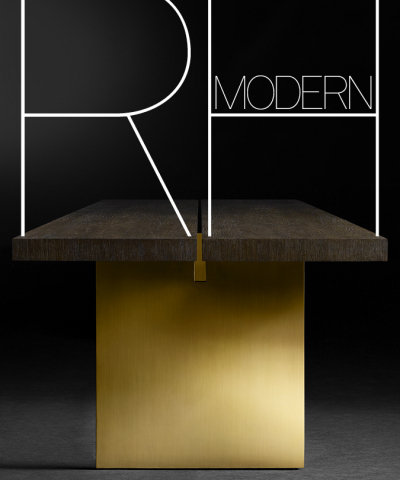 For more on RH Modern, visit RHModern.com. This release contains forward-looking statements within the meaning of the federal securities laws, including statements related to the comprehensive design of the 2017 RH Modern Source Book, statements regarding presenting one of the largest curated and fully integrated assortments of modern furnishings, lighting and décor under one brand in the world, and similar statements. You can identify forward-looking statements by the fact that they do not relate strictly to historical or current facts. We cannot assure you that future developments affecting us will be those that we have anticipated. Important risks and uncertainties that could cause actual results to differ materially from our expectations include, among others, risks related to the number of new business initiatives we are undertaking; our ability to introduce new products and merchandise categories that will be of interest to our customers and to new customers; as well as those risks and uncertainties disclosed under the sections entitled “Risk Factors” and “Management’s Discussion and Analysis of Financial Condition and Results of Operations” in RH’s most recent Annual Report on Form 10-K filed with the Securities and Exchange Commission, and similar disclosures in subsequent reports filed with the SEC, which are available on our investor relations website at ir.restorationhardware.com and on the SEC website at www.sec.gov. Any forward-looking statement made by us in this press release speaks only as of the date on which we make it. We undertake no obligation to publicly update any forward-looking statement, whether as a result of new information, future developments or otherwise, except as may be required by any applicable securities laws.